How are your state’s finances? Just how well do your state’s finances compare to those of other states? I sat down with our state policy group last week to discuss recent Mercatus research that ranks states’ fiscal condition based on the their 2012 Comprehensive Annual Financial Report (CAFR). The findings contained in State Fiscal Condition: Ranking the 50 States by Dr. Sarah Arnett are aimed at helping states apply basic financial ratios to get a general picture of fiscal health. Dr. Arnett’s paper uses four solvency criteria developed in the public finance literature – cash solvency, budgetary solvency, long-run solvency and service-level solvency. In this podcast, I discuss how legislators and policy analyst might use the study and the limitations of ratios and rankings in understanding a state’s deeper financial picture. This entry was posted in Balanced Budget, New Research, Public Finance, Tax and Budget and tagged CAFR, Comprehensive Annual Financial Report, EN, research, Sarah Arnett, State Fiscal Condition Ranking, State Fiscal Rankings on February 11, 2014 by Eileen Norcross. Budgetary balance continues to evade Maryland. In FY 2015 the state anticipates a deficit of $400 million. A fact that is being blaming on entitlements, mandated spending, and fiscal mismanagement in the Developmental Disabilities Administration. The agency has been cited by the HHS Inspector General as over billing the Federal government by $20.6 billion for Medicaid expenses. For over a decade the state has struggled with structural deficits, or, spending exceeding revenues. The state’s method of controlling spending – the Spending Affordability Commission – has overseen 30 years of spending increases, and its Debt Affordability Commission has compounded the problem by increasing the state’s debt limits in order to expand spending. For the details, visit my blog post for the Maryland Public Policy Institute. 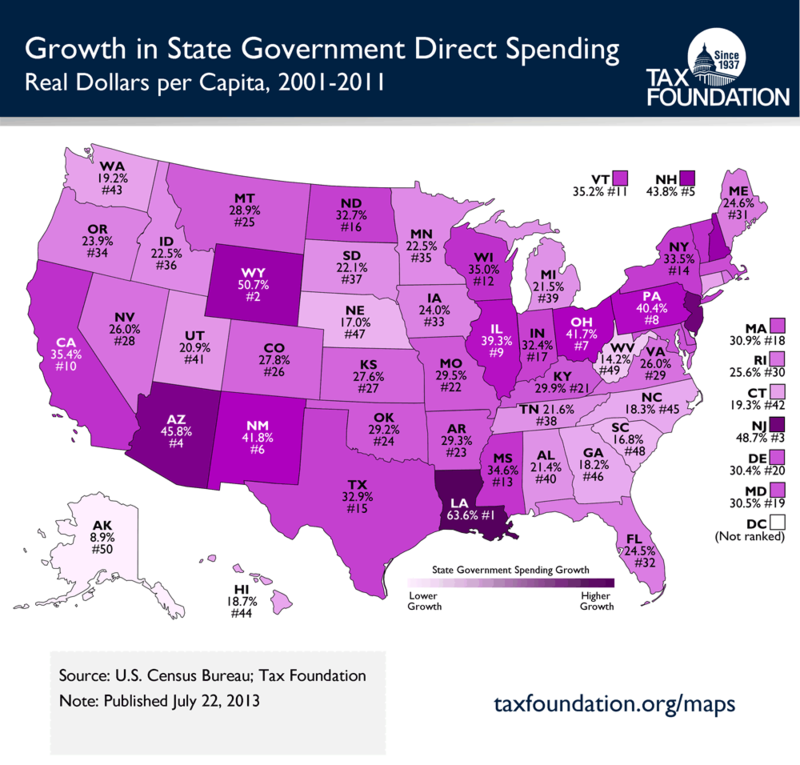 Of related interest is the Tax Foundation’s recent ranking of government spending the states. Maryland ranks 19, and has increased spending by 30.5% since 2011 2001. This entry was posted in Balanced Budget, Debt, Economic Growth, Economic Policy, Public Finance, Tax and Budget and tagged budget, Debt, Debt Affordability Commission, Developmental Disabilities Administration, Great Recession, growth, Maryland, Maryland Policy Journal, Maryland Public Policy Institute, Medicaid, rules, SAC, spending, Spending Affordability Commission, Spending Affordability Committee, Tax Foundation on October 17, 2013 by Eileen Norcross.